Soft enough for even the most delicate interior surfaces. The Griots Garage Dual-Weave Interior Towels are specially designed towels perfect for cleaning the interior of any car. The super soft microfiber trimmed with a satin edge is safe on any delicate interior surface. The short, diamond weave lifts and traps dirt, dust, and other interior debris from vinyl, leather, upholstery, and even your car’s headliner! Use Griots Garage Dual-Weave Interior Towels with Griot's Garage Interior Cleaner for a spotless interior surfaces. Having a different set of towels for each area of your car is very important. You don’t want the towel you used on your wheels to buff out wax, right? Aside from cross-contamination with different products, there is also a specific type of microfiber blend you want to use in each instance. For interior cleaning, you want something that has a tight enough weave to grab and trap dirt and dust, but you don’t want something so plush that it leaves lint behind. The Griots Garage Dual-Weave Interior Towels have a special blend of microfiber especially for your interior surfaces. The low-nap, tight-weave fibers of the Griots Garage Dual-Weave Interior Towels loosen dirt and other stains on interior surfaces, making them easy to wipe away. The soft microfiber, satin edges and tag-less design ensure that no interior surfaces fall victim to towel induced scratches. Griots Garage Dual-Weave Interior Towels are the perfect pair for Griot’s Garage Interior Cleaner. This combo will make sure you have the best looking interior possible! The only product I will use in wiping & cleaning my cars. 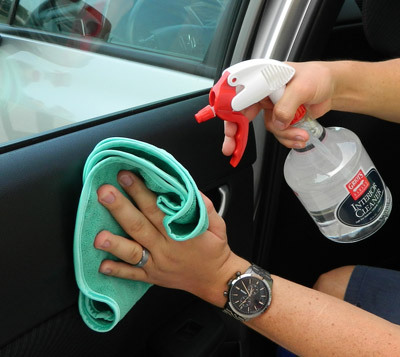 Perfect for interior cleaning. I use it with McKees Total Interior Cleaner. Cleans great, wipes off clean, no residue, and no lint.